1. PROJECT 4060 - The largest non-weapon radioactive material accident in the US. 2. Plutonium / Americium recovery operations in a German village. 3. 90,000 Rad extremity exposure to an open beam particle accelerator. Of particular importance is the reasoning process and professional leadership required in communicating with the press and the general public. Involved in health and medical physics for over 40 years, John Swanson, PhD entered the profession while serving in the Air Force. Dr. Swanson said this field gives him the opportunity to interact directly with patients and the opportunity to practice the engineering and physics skills that he enjoys. Dr. Swanson earned a pre-med BS in biochemistry from Rollins College in Winter Park, FL, and went on to earn a MS in health physics from University of Miami School of Medicine. He then earned a PhD in medical physics/nuclear engineering from the University of Florida, Gainesville. During his 25 years in the Air Force, Dr. Swanson served as a C-130 Control Officer in Vietnam and a European Consultant in Diagnostic and Health Physics in Germany. He also spent time as the Air Force Medical Physicist and was the medical physics consultant to the Air Force Surgeon General. 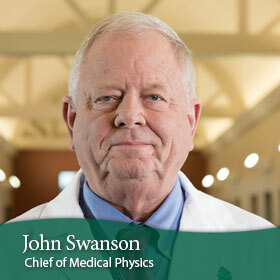 Dr. Swanson continued his career in medical physics after leaving the Air Force, working at various hospitals as Chief Medical Physicist and Director of Radiation Oncology and Medical Physics. Prior to joining Cancer Treatment Centers of America (CTCA), Dr. Swanson owned and operated his own practice. Board certified in therapeutic radiological physics, medical physics and diagnostic physics, Dr. Swanson has held numerous academic appointments in radiological sciences, internal medicine and physics at Wright State University in Dayton, Ohio. He has also given speeches at large healthcare networks and professional organizations such as the Association of Physicists in Medicine Annual Meeting and the Air Force Annual Health Physics Symposium. Dr. Swanson is a member of the American Association of Physicists in Medicine (chapter president in 1998, board of directors 1999-2002), American College of Radiology and the American College of Medical Physics, to name a few.